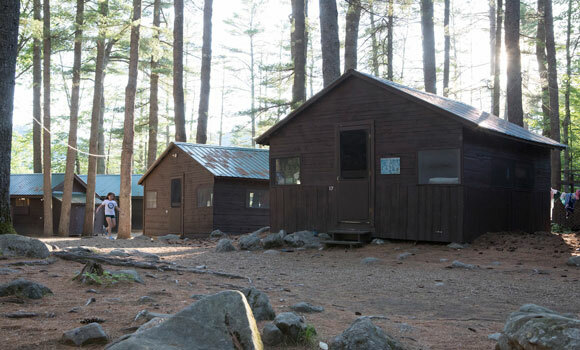 Eaton, New Hampshire, is home to Camp Waukeela. Surrounding 45 acres alongside Crystal Lake’s shore — we are two and a half hours north of Boston, Massachusetts, and just one hour from Portland, Maine. Our lakefront campus offers tall pines and no shortage of natural beauty. Many parents enjoy making a vacation out of visiting Waukeela. With unmatched views of Cragged Mountain and skiing close by, there’s plenty to do, for all comfort levels of adventure. Here is a list of local hotels, inns, and restaurants near camp. 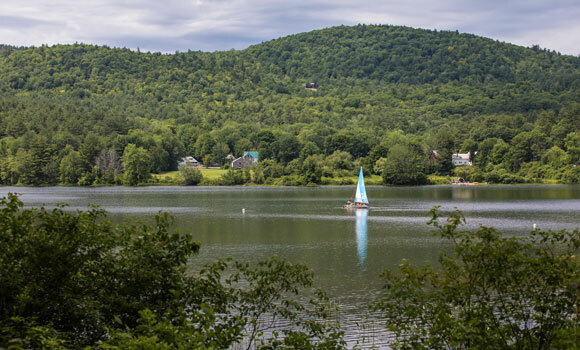 Check out An Insider’s Guide To New Hampshire’s Lakes Region or browse the New Hampshire tourism website for trip ideas. Waukeela’s picturesque location is accessible, too! Two international airports are a short distance away. We have transportation options for your child, even if you’re unavailable to drive. 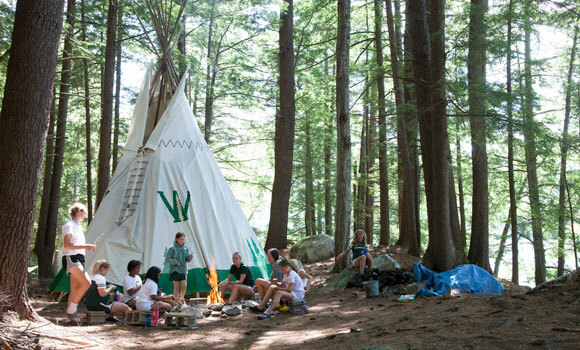 Camp Waukeela is located six miles south of Conway, New Hampshire, on RTE 153. For those who live nearby, you are welcome to drop off your camper(s). Just set your GPS destination to 23 Brownfield Road, Madison, New Hampshire, grab some snacks, and hit the road! About a third of our campers fly in from around the country (and the world). There is a small regional airport near camp for those that would prefer to charter a private flight. We offer transportation services to and from Boston Logan Airport (BOS), but Portland Jetport (PWM) is preferred, as it is closer to camp. There’s no place on earth like Waukeela! Majestic pine trees, a crystal clear lake, and 45 acres of absolute beauty make up our summer home and campus that we call The Pine Grove. In addition to expansive outdoor space, we have more than 56 buildings to house our indoor activities, dining, living, and more. From our pristine beach along Crystal Lake, you can see Eaton’s well-known landmark, the Little White Church. With no motorized boats allowed on the water, campers are free to kayak, paddleboard, and canoe one mile across and three miles around. Campers live in wood cabins with screen windows and doors. Along with 4 to 5 bunkmates, each cabin has a counselor who is responsible for taking care of each camper. Our cabins have electricity and are a short walk to shared bathrooms. Junior (link) and Senior Alley (link) refer to the two rows of cabins arranged side by side. All campers of all ages come together to eat delicious meals in one large dining room. Songs, laughter, and cheer reverberate from the walls at each of our communal meals. Our dining hall attaches to one of the other most famous Waukeela buildings: The Bung! We use The Bung for some of our indoor activities, and The Bung Porch is a great place to sit and have a conversation with a friend or counselor. Both the dining hall and The Bung are original structures that have existed since Waukeela’s 1922 inception. They continue to contain much laughter and joy. The best way to experience the magic of camp is to schedule a visit and see it for yourself! We would love to accompany you on a private tour. 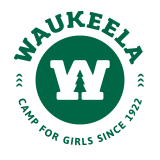 We hold private tours year-round, where families can tour our grounds, cabins, and experience life at Camp Waukeela, but your child will get to experience a bit of what camp is really like on our summer tours. See you at The Pine Grove! Can’t Visit? Take the Virtual Tour! If you can’t see us in person, the next best thing is to check out our Virtual Tour below to get a feel for camp.